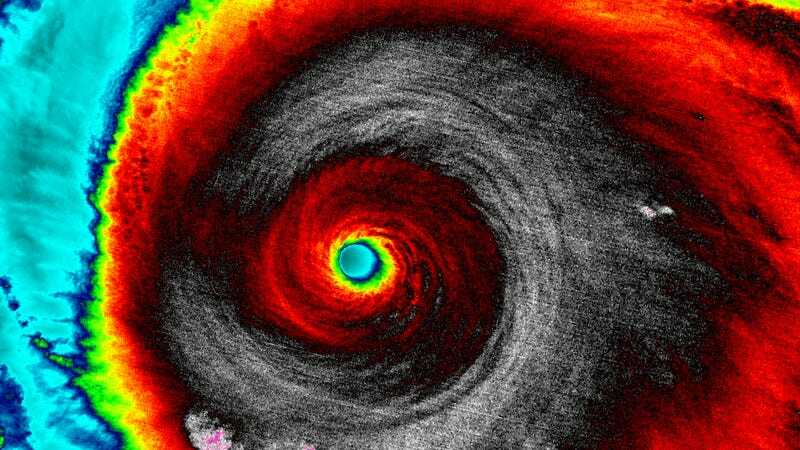 Hurricane Patricia in 2015 was the second most intense tropical cyclone ever on record, traveling up the Pacific coast of Mexico with winds topping out at 215 miles-per-hour. Despite the fierce conditions, scientists still had science to do, and they flew in a plane through its eyewall on October 23, 2015. The plane’s instruments measured gamma-rays blasted from lightning inside the hurricane, as well as what seemed to be beam of positrons, the antimatter opposite of electrons. Events like these are probably more common than you’d think. “These terrestrial gamma-ray flashes can happen in any storm that makes lightning,” David Smith, one of the study’s authors from the University of California, Santa Cruz, told Gizmodo. The scintillators flashed 184 times in the split-second following a lightning bolt in Hurricane Patricia’s eyewall. Based on their modeling, the signal matched what a downward beam of positrons would look like—meaning they didn’t measure positrons directly. This is the first time such an effect has been measured in a hurricane’s eyewall, though it’s been known to happen in lots of different kinds of storms. And no, the positrons aren’t anything to worry about, since you’re probably already being struck by lightning. Positrons are a typical byproduct of certain radioactive sources, and their numbers drop off precipitously with distance. Still, said Smith, if you were in a plane at the exact unluckiest place at unluckiest time (higher than their experimental plane flew) you might receive a deadly dose of radiation.